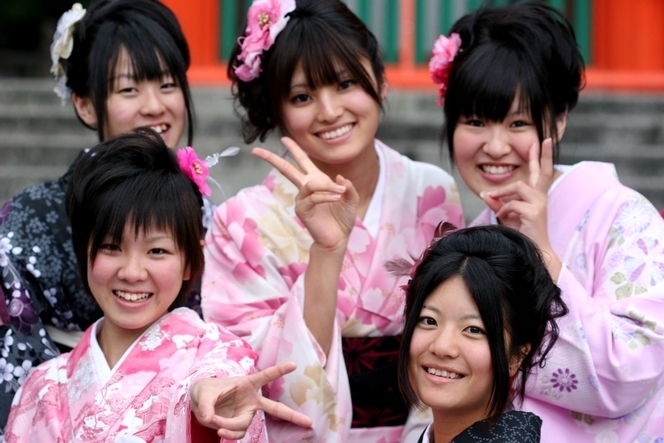 Kyoto is undoubtedly a traditional city, but that does not exclude a certain sense of fun. I have chosen these happy Japanese women, who must sometimes wear less classic outfits than these, to be my ambassadresses in wishing you a wonderful year in 2011, a year in which we might allow ourselves to express our “joie de vivre” in front of a passing photographer, a year in which we might take the time to observe such delicate things as the petals of cherry blossom. I loved your blog. Exploring the world’s teas – what an adventure!! I’m a (less adventurous) tea fanatic! I’m in Hong Kong next week to buy tea and Tokyo at the end of February. I was planning a day trip from Tokyo to Shizuoka to buy tea. Do you have any advice on which village to visit in Shizuoka that would be best for a tea lover? I currently live in the South of France and I was so buzzed to see that you have a Tea School in Paris. That will be my next trip. Dear Francois: Thank you so much for the recommendation. I’m setting my compass now! Tea courses in French will not be a problem. I managed to survive the Cordon Bleu in French so le voila! I’m in Hong Kong right now sampling tea and I think its been a good year for Ti Guan Yin. I’ll post you some when I return. Thanks again! Dear Jennifer, thank you for your delicious samples !